In our institute, we have recently found a child Japanese monkey who is characterized by deep wrinkles of the skin and cataract of bilateral eyes. Numbers of analyses were performed to identify symptoms representing different aspects of aging. In this monkey, the cell cycle of fibroblasts at early passage was significantly extended as compared to a normal control. Moreover, both the appearance of senescent cells and the deficiency in DNA repair were observed. Also, pathological examination showed that this monkey has poikiloderma with superficial telangiectasia, and biochemical assay confirmed that levels of HbA1c and urinary hyaluronan were higher than those of other (child, adult, and aged) monkey groups. Of particular interest was that our MRI analysis revealed expansion of the cerebral sulci and lateral ventricles probably due to shrinkage of the cerebral cortex and the hippocampus. 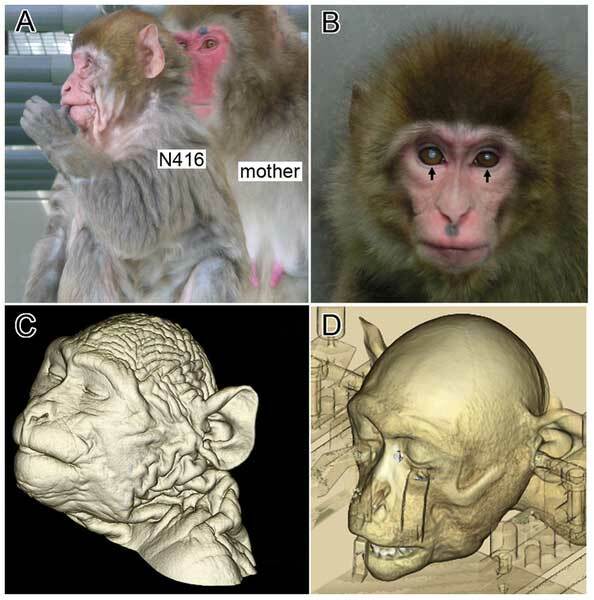 In addition, the conduction velocity of a peripheral sensory but not motor nerve was lower than in adult and child monkeys, and as low as in aged monkeys. However, we could not detect any individual-unique mutations of known genes responsible for major progeroid syndromes. The present results indicate that the monkey suffers from a kind of progeria that is not necessarily typical to human progeroid syndromes.